More of a preparation than a recipe, regardless it's a great one to share for busy moms, working women and families alike. 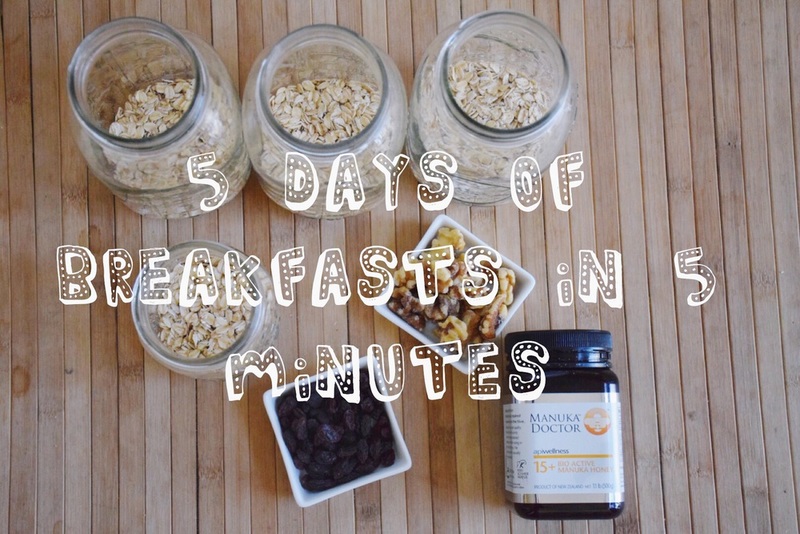 An easy, on the go breakfast, that you can prepare for the entire week, in just 5-minutes on a Sunday afternoon. Oatmeal, an excellent source of soluble fiber, is a healthy and nutritious way to start your morning. You can personalize your breakfast by adding your favorite toppings, such as milk, fruit or nut butters, which will keep you feeling satiated until lunchtime. 1. Collect your jars and equipment. I use pint-sized jars because they allow a little more room for adding nuts, raisins, and milk later, but you can also use half-pint jars if that's all you have on hand. 2. Bring the oats, water and salt to a boil. Simmer for about 3 minutes then turn off the heat. 3. Spoon the oats and water into the jars. Cover the jars tightly with their lids and leave on the counter overnight. 4. The next morning, put all but one of the jars in the refrigerator. Take the cap off the jar and stir up the oatmeal inside. Microwave for 2 to 3 minutes, or until hot. Add milk, raisins, or other mix-ins that you prefer and enjoy! Additional Notes: • You can also add your raisins, cinnamon, or other mix-ins to the rest of the jars before putting them away in the refrigerator. Then all you have to do is grab one and go on your way out the door in the morning. You may also like slow cooker oatmeal (here) or raw oatmeal that tastes like dessert (here).